There aren't enough food, service, value or atmosphere ratings for Tropical Smoothie Cafe, Florida yet. Be one of the first to write a review! Our freshly prepared wraps are toasted to perfection. Packed with bold, flavorful sauces, quality meats, a variety of cheeses and fresh veggies. Grilled chicken, wontons, carrots, sesame seeds, romaine, cilantro, scallions & thai peanut dressing in a flour tortilla. Grilled chicken, southwestern rice with corn, black beans & asparagus, red onions, low-fat mozzarella & jamaican jerk sauce in a flour tortilla. Grilled chicken, tomatoes, romaine, buffalo sauce, low-fat mozzarella & light ranch dressing in a flour tortilla. Grilled chicken, parmesan, tomatoes, romaine & caesar dressing in a garlic herb tortilla. Turkey, swiss, tomatoes, romaine & light ranch dressing in a garlic herb tortilla. Hummus, pepper jack, southwestern rice with corn, black beans & asparagus, red onions, romaine, tomatoes & light southwest ranch dressing in a garlic herb tortilla. Our freshly prepared sandwiches are toasted to perfection. Packed with bold, flavorful sauces, quality meats, a variety of cheeses and fresh veggies. House-made with grilled chicken, cranberries, grapes, granny smith apple, pecans & a romaine spinach blend on thinly sliced seedilicious bread. Turkey, swiss, bacon, tomatoes, a romaine spinach blend & light ranch dressing on a ciabatta. Ham, turkey, bacon, swiss, parmesan, tomatoes, a romaine spinach blend & chipotle mayo on a ciabatta. Turkey, cheddar, gorgonzola, bacon, dijon honey mustard and house-made kale & apple slaw on thinly sliced seedilicious bread. Our freshly prepared Flatbreads are toasted to perfection. Packed with bold, flavorful sauces, quality meats, a variety of cheeses and fresh veggies. Grilled chicken, bacon, romaine, tomatoes, pepper jack & chipotle mayo on a toasted flatbread. Grilled chicken, tomatoes, parmesan, low-fat mozzarella & pesto on a toasted flatbread. Grilled chicken, green & red peppers, red onions, romaine, low-fat mozzarella & light southwest ranch dressing on a toasted flatbread. Grilled chicken, green & red peppers, romaine & feisty feta® cheese spread made with feta, tomatoes and green onion on a toasted flatbread. Our artisan tacos are unexpectedly different! Fresh new flavor blends of signature sauces and hand-made toppings that take tacos to a whole new place. Steak, house-made cucumber & kale slaw and sweet & spicy asian bbq sauce in a flour tortilla. Grilled chicken, bacon, cabbage, tomatoes, red onions & smoked jalapeño spread in a flour tortilla. Steak, cucumber, sriracha aioli and a house-made sweet chili slaw with cabbage, carrots & basil in a flour tortilla. Grilled tilapia, cabbage, spicy cilantro sauce and house-made roasted pineapple salsa with red onions & cilantro in a flour tortilla. Our handcrafted salads deliver an exciting, flavorful combination of ingredients with fresh greens, delicious toppings & delectable dressings. Drink to your health! Start your day the feel better way with one of our delicious, nutritious smoothies. Or enjoy our breakfast wraps and sandwiches any time of the day. Eggs, grilled chicken, pepper jack, tomatoes, spinach & chipotle mayo in a toasted flour tortilla. Eggs, feisty feta® cheese spread, swiss, spinach, tomatoes & pesto in a toasted flour tortilla. 12 & under. Small guests love the big flavors on our menu, and parents appreciate the goodness of our wholesome foods and smoothies blended just for kids. Kid's food item with choice of side & 12 oz. kid's smoothie. All 12 oz. smoothies are made with turbinado unless otherwise requested or noted. Orange juice, white chocolate, orange, & non-fat yogurt. Real good smoothies. Fresh, healthy and all nature ingredients. They have just one size so its more like a meal. I keep coming back so it must be amazing right! Once again I had the Avocolada which was great, Enzo was my server, very fast and friendly, I'll be back again. 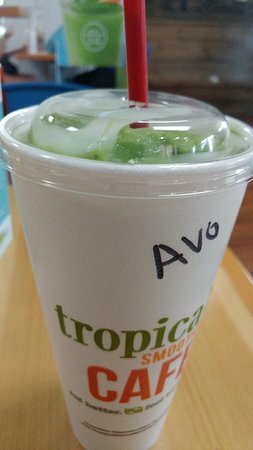 Tired the Avocolada for the first time, avocado, pineapple, kale, coconut and lime, it was excellent, great flavor /taste, would definitely get it again. Great smoothies but Tasty food too! I was disappointed that they did not have gluten-free bread/wraps as an option with how many people are gluten sensitive these days. My Island Green smoothie tasted very good. The best place for smoothies and fresh sandwiches, love this place, can eat outdoors too. Staff is very friendly and helpful. 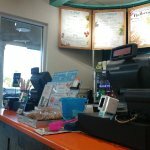 Get quick answers from Tropical Smoothie Cafe staff and past visitors.